With theatrical-quality HD imaging, this is the camera that set the standard for high-end documentary and commercial digital cinematography. NTSC / PAL switchable with a 2/3" CCD, 16:9 aspect ratio, recording rates at 24/25/30 frame progressive or 50/60 interlace at 1080 resolution. Package includes: Canon 11x4.7 zoom; 4 IDX on-board batteries, charger. Chroziel 2 stage mattebox w/ filters (Polarizer, ND.6 Grad, Clear); 7" on-board HD Monitor. 4 IDX on-board batteries; charger. * Optional add-ons include: Canon zoom control; Chroziel 2 stage mattebox w/ filters (Polarizer, ND.6 Grad, Clear); 7" on-board HD Monitor. This groundbreaking non-linear HD camcorder has become the first choice for independent filmmakers who have stepped up to the non-linear workflow. 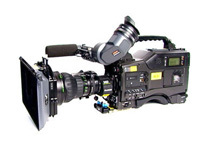 A professional CineAlta camera featuring 3 CMOS ½" sensors, a Fuji 14x zoom lens, and multi frame-rate capabilities, recording NTSC or PAL to SXS cards. Package includes: 3 batteries, 4 SxS cards and a wide-angle lens. Canon redefined the DSLR with this full frame, 21-megapixel camera which is also capable of recording full 1080P HD video. Package includes: 2 L-Series lenses, shotgun mic, 2 batteries and 2 cards. This video production package includes 2 stage mattebox, filters, 3 lenses, wireless or shotgun mic, tripod, HD monitor, 4 memory cards. 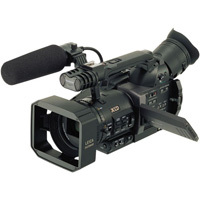 Sony’s A1u Camcorder features HDV 1080i recording to MiniDV tape, XLR Mic inputs, and simple controls. Package includes Sony A1u camera, wide angle & telephoto lenses, shotgun mic, zoom control, 3 batteries, fluid-head tripod, and 1 wireless microphone. 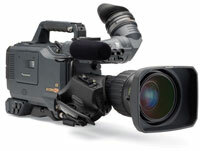 Ultra-compact HDV 1080i camcorder, featuring simple controls with excellent high-definition results. Same acquisition format and size as Sony's popular A1U. Switchable HDV or DV formats, records to MiniDV tape, nightshot capablities and fits inside the Stingray underwater housing. Package includes: wide-angle lens. High-end standard definition acquisition in a Mini-DV package. Great image quality and operating ease makes this camera suitable for most professional applications. Features switchable Progressive / Interlaced modes and complete pro audio functions (two built-in XLR inputs). Package includes: Century wide-angle lens, 2 batteries, charger. 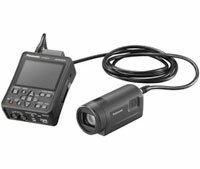 This ultra-compact, mountable POVCAM offers a full HD camera recording system with remote camera head, a recording unit with comprehensive camera controls / built-in monitor, and detachable cable. 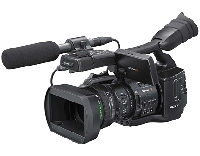 The 1920x1080 HD video records in AVCHD format to SD/SDHC memory cards in both NTSC & PAL up to 60/50fps. Ideal for use with the Polecam or in any remote-camera application. 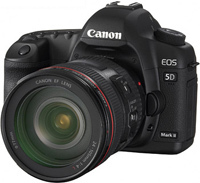 Package includes: Century wide-angle lens, SD card and options of a 9' or 50' cable. This tiny all-in-one camera / monitor / record-unit provides stunning 1080i HD images in a POV camera body. 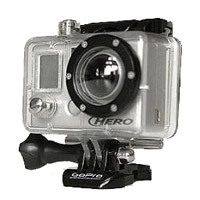 Popular with extreme-sports shoots, this POV provides unique angles with full camera controls. 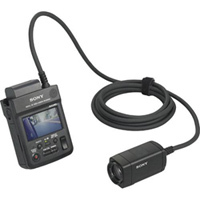 Records 1080 59.94i to Memory Stick in AVCHD format. Perfect for acquiring high-intensity action sports in a waterproof and shockproof package. Records up to 4 hours at a time to multiple frame rates including 1080p/i, 24/25/60fps. 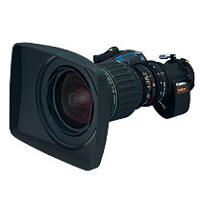 Industry leading super wide angle HD lens. F1.9 ENG style with Servo Zoom and 2x Extender. * Optional add-ons: 2 Stage Mattebox, filters (Polarizer, ND.6 Grad, Clear). The Travel Series Crane consists of 4-foot sections packed in 6 durable hard cases for frequent location traveling. Featuring a 25' arm with remote head suitable for full-size video or film cameras with the entire package able to fit in a standard SUV. 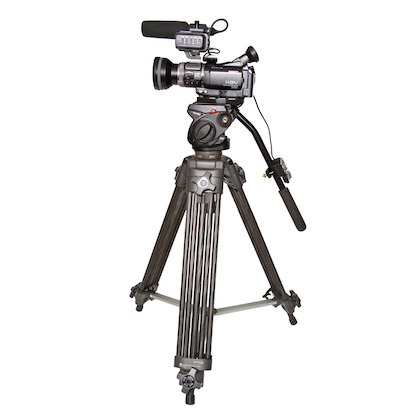 Comes with up to 400 lbs of counter-balance weight and the option of an SD or HD monitor. A 25' lightweight carbon fiber arm that can go where traditional jibs cannot: rig over cliffs, on boats, in pickups and inside tight locations. Polecam sets up very quickly with no tools required; can be repositioned in minutes and breaks down into 2 airline-approved bags. HD or SD POV cameras are mounted on to the remote head, and the arm can be extended in 4-foot sections to 20 feet. Kit includes crane, remote head, tripod & head. This ultra-compact kit is a great choice for distant locations where a jib is needed for use with a camera of your choice. Fits into a single duffel bag for travel. Capacity up to 35 lbs and 2 extensions included, offering big-budget movement at a small-budget price. 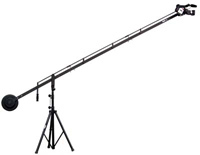 Package includes: tripod, 12' arm and weight cage. Great for achieving higher production value on a tight budget - requires no experience to assemble and operate and is perfect for DSLRs and small camcorders.